Quibbles with the clarity of higher-gain tones aside, AmpliTube Hendrix provides a solid selection of usable, Hendrix-inspired tones on a device smaller than a printed magazine. And that's an enticing prospect, no matter how you look at it. Feature-laden. Value for money. Easy to use. Portable. It still doesn't match the feel of the real thing. 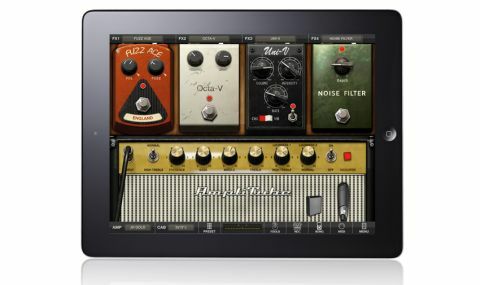 Hot on the heels of the Slash edition of the ever-popular AmpliTube app, IK Multimedia has set another guitar legend in its sights and conjured up a fresh spell of amp-modelling wizardry, this time in dedication to the one and only Jimi Hendrix. Users of the desktop version of AmpliTube have actually had access to these models already, but this new app means that you can now take these tones away with you wherever you go. "You've got a choice of two amps: the JH Gold and JH Dual, based on a Marshall JTM45 and Fender Dual Showman, respectively"
To kick things off, you've got a choice of two amps: the JH Gold and JH Dual, based on a Marshall JTM45 and Fender Dual Showman, respectively. Played clean, both amps are crisp, warm and dynamic. The JH Gold is a smidge warmer and mellower on its normal channel, but the high treble mode narrows the gap, adding sparkle and bite. Increasing the volume adds a good amount of drive, further distancing it from the brighter, jangling cleans and light break-up of the JH Dual. The latter also has built-in reverb and tremolo effects for good measure. Each amplifier comes with a matching cab, and you can opt for either a condenser or dynamic microphone model. No collection of Hendrix tones would be complete without effects, and IK Multimedia has obliged with a selection of stompboxes (or should that be tapboxes?) based on Jimi's favourites. The Fuzz Age and Octa-V are modelled on the Arbiter Fuzz Face and Roger Mayer Octavia, two pedals that were integral to Jimi's sound. With careful adjustment, you can get some fun sounds out of them, but it's also very easy to overload the amps with too much gain and turn your tone to an incomprehensible mush - a shame. The Uni-V is based on the Univox Uni-Vibe, and offers both the chorus and vibrato modes of the classic phase shifter for all manner of throbbing, pulsing ambience. Once you've registered the app, you also get the Wah 46, based on Jimi's famous Vox V846 wah, which offers a nice hit of vintage-tinted warble. And last but not least, there's a noise filter to help tame excess noise. Modelled tones aside, the app gives you an extensive collection of discography presets based on Hendrix's best-known tracks, even breaking them down into different sections. Then there are the standard AmpliTube extras, including a one-track recorder (expandable to eight tracks via in- app purchase), speed trainer, tuner and metronome. Particularly cool is the song player, which lets you import tracks from your iOS device or from your PC/Mac via Wi-Fi. It's no secret that Hendrix fans are obsessive when it comes to tone. An app like this is never going to replace a Marshall and some good-quality effects - but that's not the point.